This featured as a side dish the other night and it just had to be shared. The recipe makes use of seasonal vegetables and uses a gentle blend of spice to bring the vegetables alive! 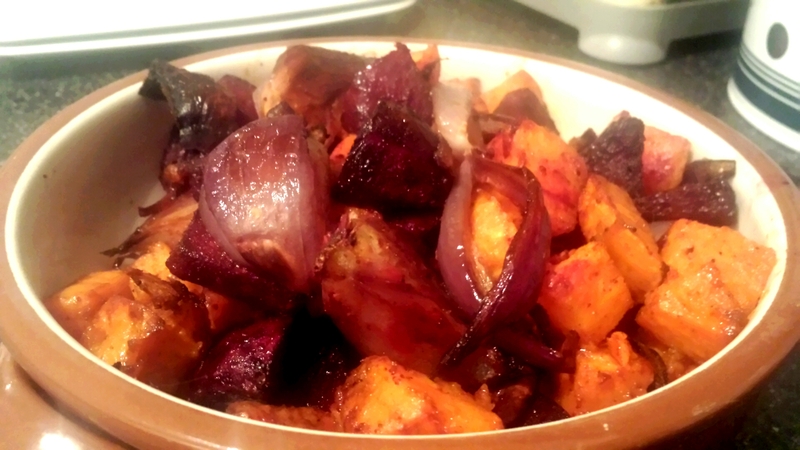 I used sweet potato, beetroot and red onion but squash and carrot would be equally delicious. 1. Preheat the oven to 160c/ 140 fan. Meanwhile chunk the vegetable into equal size chunks. Take each of the vegetable in turn and share the spice mix between them and place the beetroot and onion on one baking tray and the potato on another. This allows you to have more control over cooking time as the beetroot will usually take a little longer. 2. When the oven has warmed, pop the beetroot in and roast for 10 minutes before then adding the other tray in for a further half an hour. When the vegetables are nearly tender I took them out of the oven and drizzle the honey and tossed the vegetables to coat well before returning to the oven for the last 5 minutes of cooking. These vegetables are a perfect blend of sweet, earthy and spicy which can be served with a simple chicken or fish dish. It could also be bulked out to make a more hearty meal in its own right by adding some crumbled feta and crispy shards of pitta bread. Finish with a sprinkling of dukkah if you like.